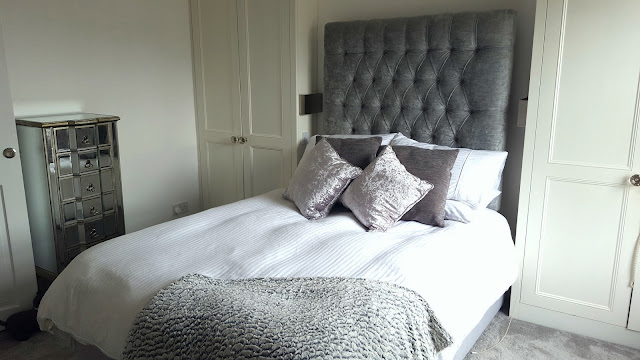 After the fiasco of losing the first house we were meant to be buying (you can read my ranty post all about that drama here), we only ended up buying a two bedroom house so we know space would be tight considering my mountains of essential 'stuff'. 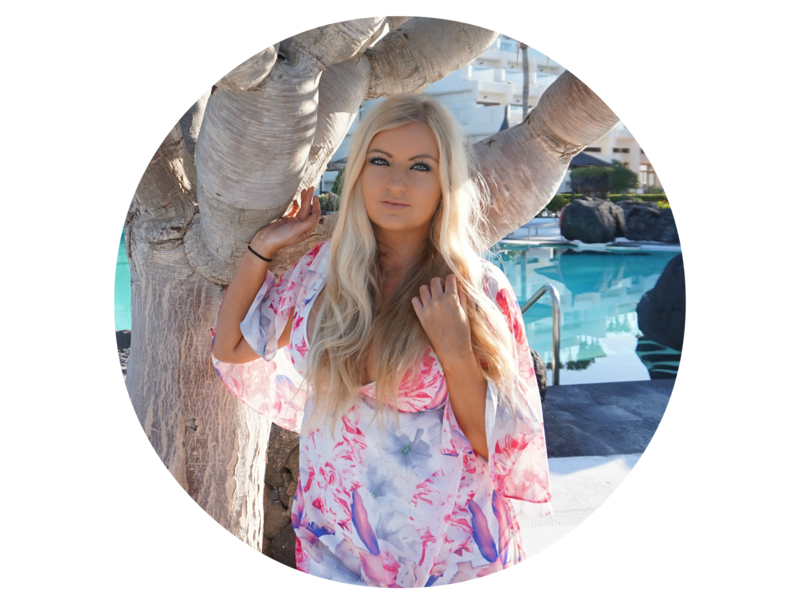 You can catch up with my post on the inspiration behind everything in our bedroom here. The master bedroom already had custom made wardrobes built in which were great for space but meant we had to give up our beloved king size bed and get a standard double. We've both always wanted a giant velvet headboard so we ended up getting one made to order. 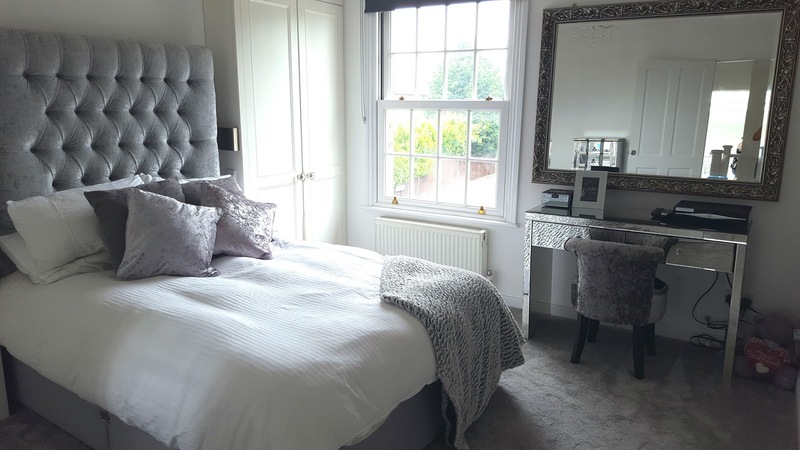 After having a very dark gothic style bedroom in the flat, we wanted to keep to our house theme of white and grey and make this room as bright as possible to make the most of the gorgeous enormous windows. My glass dressing table was a Christmas present from Luke the previous year and I love it so much although it shows dust within 30 seconds of cleaning it! The dressing table chair and chest of drawers are both one of pieces from our local garden centre - seriously, their furniture is so stunning we could have furnished the entire house with it. If you saw our previous flat, you'd know I'm in love with stripey wallpaper (the one in the flat had tiny specks of glitter in, it was utterly amazing! ), so this room was no different. We went for a really subtle light grey and white stripe wallpaper for the back wall along with an even more subtle white stripe bedding set, both from Laura Ashley, with some throw pillows to decorate. As with all the lighting in our house, the chandelier is from my beloved BHS! As for the spare room, this was originally a baby's room and it was most definitely not staying that way! It was hard to figure out what to do with it at first as it's so small. 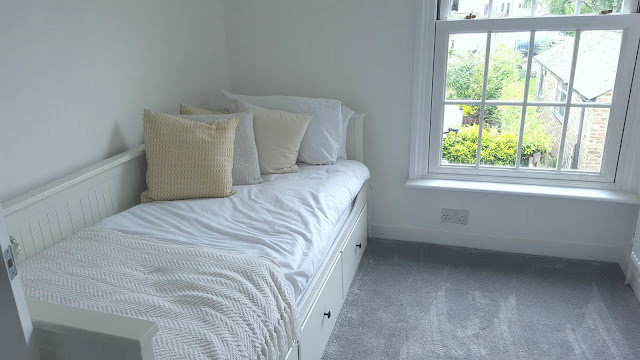 We wanted a space where we could have friends to stay - mainly because my blogging babes stay over most weekends, but also we didn't want a double bed taking up the entire room. After a very lengthy trip to Ikea, we found a perfect day bed with drawers underneath and a pull out bed turning it into a large double. It's so perfect for when the girls stay over and it's plenty big enough for 3 people. We also bought a big French style wardrobe from Dunelm Mill (which I don't particularly like as I think it's too deep and takes up too much room), another large ornate style mirror and of course, another light fixture from BHS which makes the most stunning patterns all over the walls at night when the light is on. This is one room I'm not 100% happy with as I think it's missing something but we just can't work out what! If you have any ideas, I'd love to hear them! 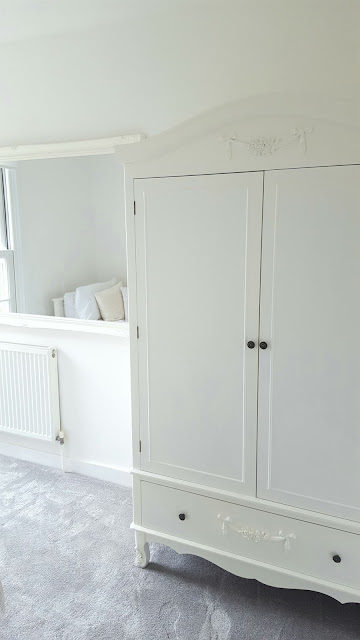 I've tried to find links to things as close as possible to the items we actually bought but most of the furniture in our bedroom is one of pieces! The only room we thought we wouldn't have the change when we moved in was the bathroom. 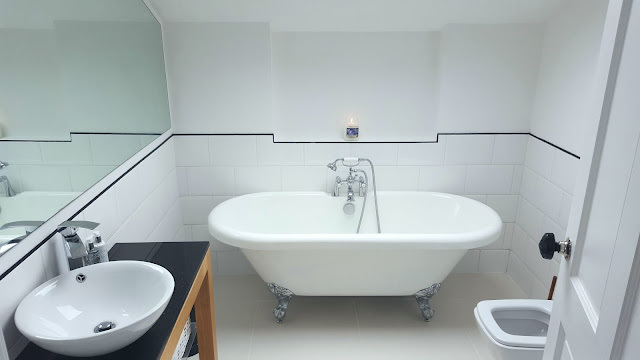 It had a gorgeous roll top free standing bath, lights on a dimmer for those super relaxing nights, and a heated floor - which trust me is a god send in the winter! However, after moving in, we found the shower didn't work, the bath hose leaked and the toilet bowl was so stained there was no way it was staying. The bathroom ended up costing us quite a lot of money and doesn't really look too different but they were all things that needed doing. We also painted the walls white to match the rest of the room. I didn't think it really made a big difference but looking at these photos, it definitely looks much better! Catch up with the before and after photos for the lounge and dining room and kitchen. Thanks lovely! I still don't feel like the spare room is finished but we'll get there - I'm just not sure what it's missing at the moment! Wow you done such a good job!! OOO I am absolutely LOVEING the grey palette going on. Makes me want to make over.. "too bad i'm renting & it's not allowed to repaint"... I love it! !